A San Francisco Bay-area man died after being run over by a World War Two-era tank during a family reunion over the weekend at a property owned by the chairman of Jelly Belly Candy Co ... 54-year-old Kevin Wright was riding on the front of the 1944 model M5 tank on Saturday afternoon when he lost his balance and fell in front of the vehicle as it traveled down a hill ... about 50 people, including children, were in attendance. Possible Tip-Off About FASTC Hard Skills Training Center at Fort Pickett? To review the situation, the administration wishes to construct a Foreign Affairs Security Training Center (FASTC) that would consolidate 'hard skills' training by the State Department and its partners at Fort Pickett in southside Virginia. Some members of Congress are trying to stop the project, ostensibly on grounds of economic efficiency, and would require the State Department to use the Federal Law Enforcement Training Center (FLETC) in Georgia for hard skills training. Both sides are currently awaiting the public release of a General Accountability Organization (GAO) report that evaluates the business case for building FASTC at Fort Pickett. This week the Progress-Index, a local newspaper in the Fort Pickett area, interviewed and quoted a senior Diplomatic Security Service official for an article about the political impasse over FASTC. Well, hum, that's interesting. I presume the senior official had gotten official clearance to make those remarks. I further presume that State gets to review the expected GAO report before it goes public. Putting 2 + 2 together, I wonder whether DS is signalling with the interview that it knows the GAO will support building FASTC at Fort Pickett? State Department officials are hoping a soon-to-be released report will help end wrangling in Congress that has delayed construction on a diplomatic security training center at a National Guard base in Virginia. Construction on the first phase of the facility at Fort Pickett, just over the Dinwiddie County border, was set to begin Aug. 1 with a completion date set for 2019. State Department officials have put that work on hold while they respond to Congressional requests for information. Soon after the State Department finalized its selection of Fort Pickett last spring, some members of Congress cried foul. The Georgia site has been championed by members of Congress there, but also by Republican U.S. Rep. Ed Royce of California, chairman of the House Foreign Affairs Committee. The State Department stands by its selection of Fort Pickett, saying its proximity to Washington, D.C., and rural location would allow it to conduct around-the-clock military-style training. 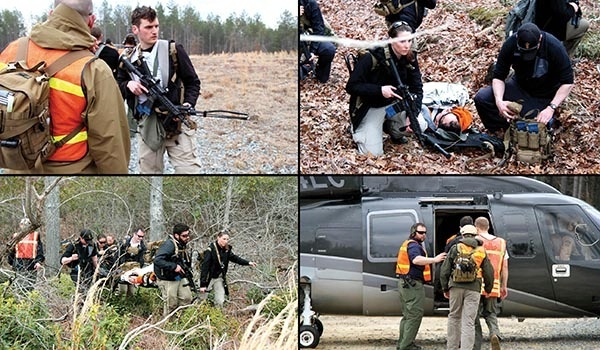 The site is also within driving distance of Marine bases in Virginia and North Carolina that State Department personnel train with, as well as Navy special warfare forces that are stationed in Virginia Beach. Stephen Dietz, executive director of the State Department's bureau of diplomatic security, said the Marines have told him that they can't afford to travel to Georgia for State Department training. He said the cost estimates for the southeastern Georgia site [FLETC} only have to do with construction, and don't include operation, maintenance or travel costs for State Department, military or intelligence agency personnel. "If we were forced to go someplace else and train without our partners, there's no doubt in my mind we would be placing security at greater risk overseas because we did not train with the people we go to fight with," he said. "If you're banking your hopes on common sense and consensus in Washington, D.C., you stay up late at night worrying," said Mayor Billy Coleburn. "Who owes who favors? Who gets browbeaten behind the scenes. Those are things we can only imagine — what happens in smoke-filled rooms in Washington, D.C?" 100 percent correct, Mister Mayor. What, indeed, happens there? It could be that somebody knows what happened concerning the GAO and Fort Pickett, and maybe he just told us. "Although researchers have taken a variety of scientific approaches to elucidating the underlying mechanism, we still do not have a full picture of how this occurs," Suntory representatives wrote in a statement ... "Our company has hypothesized that the formation of high-dimensional molecular structure consisting of water, ethanol and other ingredients in alcoholic beverages contributes to the development of mellowness, and we have been conducting collaborative researches on this topic"
Like I figured yesterday, the foreign press might describe any U.S. serviceman as a "Marine." As it happens, the two young men who intervened so successfully in the train attack were Alek Skarlatos, an Oregon Army National Guard infantryman, and Spencer Stone, a U.S. Air Force airman, along with a third, Anthony Sadler, a student at Sacramento State University. All three are lifelong friends who were traveling through Europe on vacation. [Interior Minister of France] Cazeneuve said that when a French passenger tried to enter a toilet on the train, he was encountered the gunman and tried, but failed to overpower him. The assailant's gun was then fired. A French-American passenger was hit by the bullet. That's when, Sadler tells the AP, that the three heard a gunshot and breaking glass and then saw a train employee running down an aisle, followed by a man carrying an automatic rifle. "As he was cocking it to shoot it, Alek just yells, 'Spencer, go!' And Spencer runs down the aisle," Sadler said. "Spencer makes first contact, he tackles the guy, Alek wrestles the gun away from him, and the gunman pulls out a box cutter and slices Spencer a few times. And the three of us beat him until he was unconscious." Skarlatos was quoted by Sky News as saying "Spencer got to the guy first and grabbed the guy by the neck." "I grabbed the handgun, got that away from the guy and threw it. Then I grabbed the AK-47 (Kalashnikov), which was at his feet, and started muzzle-bumping him in the head with it," Skarlatos said. "Everybody just started beating the guy while Spencer held the chokehold until he went unconscious." According to France24, when Skarlatos checked the AK-47, it had jammed and would not have been able to fire. The cartridge for the handgun had also been dropped, he said. “I noticed when I removed the round in the chamber of the AK that the primer had been stuck [TSB note: obviously, that should have been "struck"]. That meant he had pulled the trigger on the AK but the primer was faulty, so the gun didn’t go off and he didn’t know how to fix it … when I cleared the handgun I noticed there was no magazine in it, so he either dropped it accidentally or didn’t load it properly so he was only able to get one shot off”. I don't know where the attacker learned to use small arms, but wherever it was, they evidently didn't stress immediate action to reduce stoppages, U.S. Army-style. He said: "I was just sitting working on my computer. 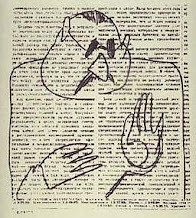 I saw a man with a Kalashnikov. I said to myself s***. "I heard an American saying, 'go get him', then someone else saying, 'no you don't do that'. Then I realised the only way to survive was to go for him." He added: "I'm not a hero I just did what I could. "The heroes were Spencer Stone and Alek Skarlatos and Anthony Sadler … The train staff thought they were just fighting. To begin with they didn't understand what was happening. "All I want to do now is go home and spend time with my family… I didn't hear him asking for his weapon back. What I did hear was Alek saying stop struggling. We got him down on the floor and tied him up while Alek went to look for other terrorists." All's well that end's well. No one was killed, and for that our French friends know who to thank. 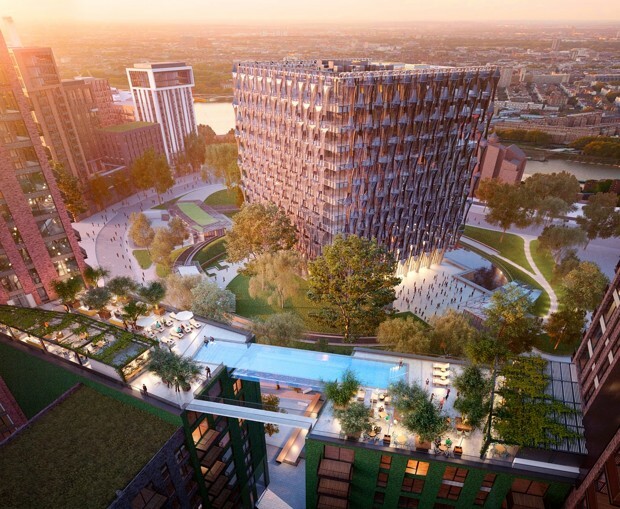 Well, well, well, it seems that our New London Embassy (NLE) - and that's the official name and acronym of that signature new embassy construction project - has already inspired an adjacent housing development to be named the "Embassy Gardens." The New London Embassy is that showpiece of design excellence currently being built by my good friends in the Bureau of Overseas Buildings Operations. The housing development that will go up next door has no connection to either the embassy or the U.S. government. However, it will reflect the NLE's architectural style by featuring a highly prominent and impractical bit of glass construction, kind of the same way our whole new embassy will be a highly prominent and impractical glass construction. Embassy Gardens, a major new housing development in the Nine Elms district near the Battersea Power Station, may feature a floating “sky pool,” a swimmy bridge suspended between two buildings. According to Homes & Property, it will measure 90 feet long, 19 feet wide, and 10 feet deep, making it one of London’s most distinctive building improvements. 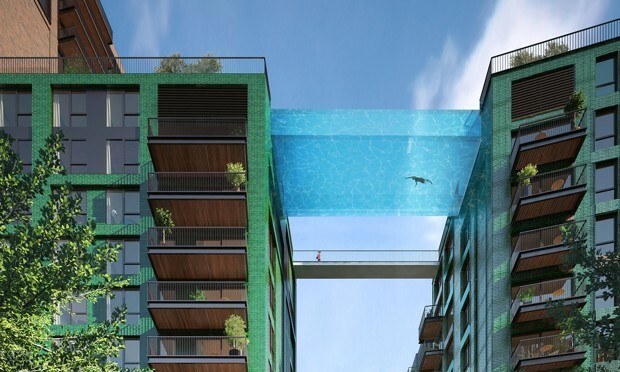 The sky pool is designed to allow condo dwellers at the Nine Elms development to casually traverse the distance between two of its towers by swimming laps. The purpose is not merely to make it easier for residents—and only residents—to get from one rooftop deck to another. It allows them to be seen while doing so. Nine Elms has a visibility problem: It insists on being seen. It flaunts. 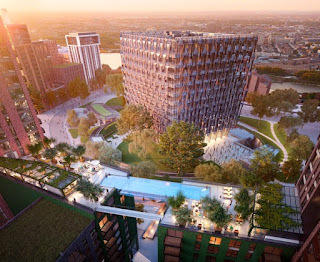 The sky pool is cousin to the Nine Elms-to-Pimlico bridge, an outlandish piece of design in the works for the development. (A winner in the architecture competition for that bridge will be named in October.) But a suspended swimming pool is so much worse than an amenity disguised as infrastructure, such as the Garden Bridge. The sky pool secures an ultra-elite experience at the cost of casually insulting a city in the grips of an affordable-housing crisis. I am envious of whoever it was who came up with the phrase "an amenity disguised as infrastructure," so perfectly does it describe my own opinion of the New London Embassy's use of glass for exterior walls. “Nobody talks to me about it other than you guys." To quote from a SNL skit, this is NOT how Hillary Clinton goes down. But from the baffled way she reacts to the most predictable of questions, and from her contemptuous treatment of the press corps asking those questions, it kind of looks like she is starting to circle the drain. There is a good timeline of the Clinton e-mail saga at the Daily Mail. It wasn't immediately known what the man was trying to accomplish. What, then, does all this mean for Hillary Clinton? There is no doubt that she, or someone on her State Department staff, violated federal law by putting TOP SECRET//SI information on an unclassified system. That it was Hillary’s private, offsite server makes the case even worse from a security viewpoint. Exactly. Someone, and almost certainly that was someone other than Hillary, committed "spillage" of information from a highly classified government information system into an unclassified government information system, and from there the 'spill' was forwarded - maybe by the same someone, or maybe by someone else - outside of the government firewall and onto Hillary's private and unsecured e-mail server. Hillary, as I said, almost certainly was merely the recipient of that spill. 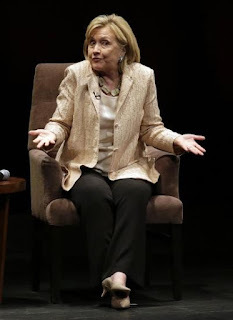 But nevertheless, her use of a private server for official communications created the vulnerability that makes this spill way worst than if it had been contained inside government networks. There’s still a lot we don’t know about Hillary Clinton’s Emailgate. Exactly how many emails contained TOP SECRET//SI information is unclear. We may never know since thousands of emails were already destroyed by Clinton. Who exactly placed the classified information in emails—it may not have been Hillary Clinton—and how did they access the information in the first place? How many of her staffers at Foggy Bottom were also using her personal server? All very good questions, and ones that have so far not been answered except by that shrug. CBS News had a good report on today's incident of shots fired at the U.S. Consulate in Istanbul, along with some good video. 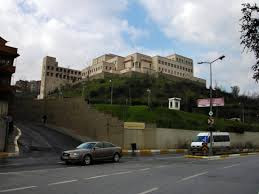 Briefly, two Turkish women fired several shots at the consulate office building, after which one escaped and the other - a 42-year old, which surprises me - was wounded by return fire from Turkish police and subsequently captured inside a nearby building where she hid. According to all reports I've seen so far, no one else was injured. The organization to which the captured women belongs, Revolutionary People’s Liberation Party/Front (DHKP/C), has been on the Department of State Terrorist Group List since 1997. DHKP-C also carried out the 2013 suicide attack on the U.S. Embassy in Ankara, which killed a locally-engaged employee of the embassy. Our consulate in Istanbul was relocated from its highly vulnerable previous location into a big ol' forbidding Fortress high on a hill several years ago, and that secure new facility helped to make today's shooting the fairly harmless thing it was. It certainly could have been worse; today's other attack by DHKP-C was a complex action in which a vehicle-borne bomb at a police station was followed up with small arms attacks on police as they responded to the bomb. Since this failed attack puts me in a happy mood, here's a happy tune - Istanbul, not Constantinople (why they changed it I can’t say - people just liked it better that way) by The Four Lads. Yeah, that was a 1950s song, long before They Might Be Giants covered it.